A teh ghey guy was trying to run for mayor of Gainesville, FL – birthplace, as I recall, of both Tom Petty and the dude from Against Me! A Christian supremacist group found out and put up a sign outside its church that read, “No homo Mayor.” When people questioned whether this violated their tax exempt status (because a church can’t back a candidate in an election, not because the state can’t provide a subsidy to religious bigots), they just got rid of the part that said “Mayor.” Roffle. 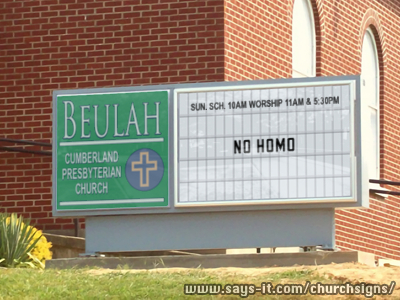 Hopefully, this will kickstart a trend of church signs that say “No Homo.” Maybe they’ll even start to work it into phrases, like Cam’ron does. That one would be especially clever, given what’s going on with the Pope.